I had a lie in this morning and to be honest, I thought I deserved it after a tiring week of pmt and a post-22 mile walk on bank holiday Monday. And after taking Hans for his morning walkies, it was almost lunchtime when we got back, so I made up a two course breakfast for my fiance and I. And since I was popping out for a 2 o’clock jumble sale near Coventry for a good old rummage for food prop kitchenalia, I didn’t know how long I would be gone for and so I thought it would be best to “fill my boots so to speak before I set off in case I got hungry away from home. The first course I instagrammed was a quick Linda McCartney sausage sandwich packed with spinach in a wholemeal roll. 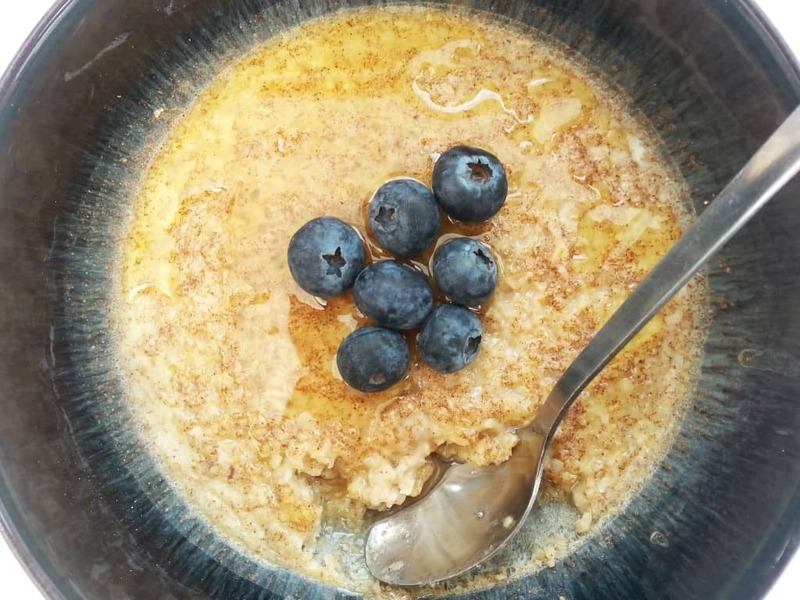 And the 2nd course were some Slimming World syn free baked oats which I am sharing the recipe with you today but I also topped with a spoonful of honey (not syn free) and some yummy blueberries. I have tried it without egg before if you prefer but it took much longer to set and bake. Note I have also more recently created a quicker microwave version in a mug if you want to sample that one out too. Top with the fruit of your choice after cooking and honey if desired. Mix all the ingredients together except the fruit.Spoon in to an oven proof bowl or ramekins and bake in the oven for 20 minutes on gas mark 4 or 180 degree. Please let me know in the comments below what you thought of it.